Brian Peterson is a freelance troubleshooter. Technically, he is a lobbyist, licensed as such to be able to operate as he wishes in the nation's capitol. More truthfully, he is a man capable of helping those in power and in trouble out of the latter quietly enough to preserve the former. His history is a sad one. Having been in the Intelligence field for a considerable amount of time, he had retired from that business to become a mildly successful lobbyist very happily married with a young daughter. He also had a Senator as a father-in-law. Then one unfortunate day while helping the Senator pack up his office after having lost his seat, Peterson received a call telling him his wife and daughter had been killed in a car accident by two joy-riding teenagers. Devastated, he escaped to Key West where for six months he lived inside any bottle that would have him. Eventually the Senator found him and helped him dry out. For wont of anything better to do, Peterson returned to the capital and his old business. It was then that he was asked by a client to help him out of a sticky situation. Peterson did and the matter was hushed up. Still, another small but indiscreet matter came to his attention and again he handled it with decorum. Soon his name was whispered as the man to see if you needed anonymous help. His lobbying business suffered but his trouble-shooting sideline blossomed. Peterson is now the man the power-movers call when officially they can or should call no one. His connections in the cloak-and-dagger field are useful in many ways as are the favors others owe him. Predictably, however, those he helps the most, the truly powerful, tend to say thanks, pay his bill, and try to forget they know him. Such is the price for being too good at your job. Information is being leaked from an ad hoc Senate Intelligence committee and the chairman is determined that the credibility of the group, not to mention his own reputation, not be destroyed. Peterson is hired to find the leak and stop it, quietly and quickly. When a Senator, about to expose major organized crime activities, is suddenly found having killed himself, only his daughter wants to know the truth. His aides won't talk, his colleagues are mute, and even his wife is hesitant to press forward. Peterson knows it best to stay out of the matter but the daughter is very persuasive. No one had ever heard of General Camillo or his National Federation Army before the man and his group kidnapped the daughter of an ultra-conservative senator. Now the demand is for $300,000 or the young woman would die. Peterson strongly advises calling in the FBI but finally agrees to take assignment with reluctance. 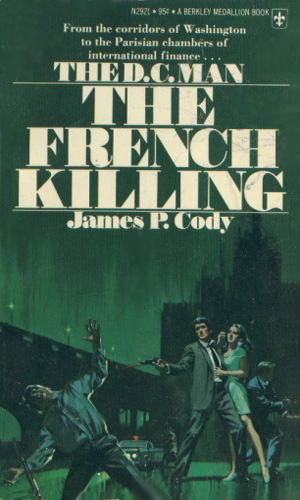 If his bank account hadn't been so low, Peterson would not have taken the job from the French embassy to be a bodyguard for a visiting rich guy. He does take the assignment, however, and is soon hunting down the men who killed his client, taking him up against some very rich and powerful opponents. 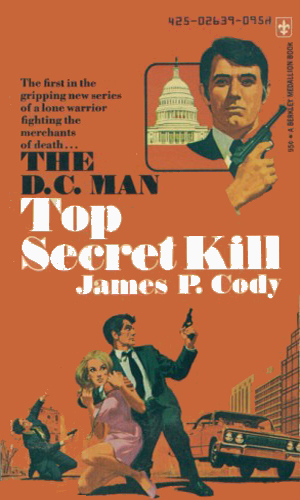 The D.C. Man series fits quite nicely in any action/adventure sub-category you might like. There are scads of violence, lots of beautiful ladies, numerous rich people doing bad things, and plenty of average people getting hurt. 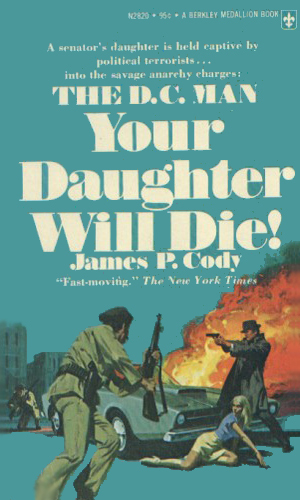 Spies and spooks and shady diplomats abound, along with crooks and radicals and everything else good and bad from the mid 70's. There is also a lot of fun reading. Don't expect too much and you'll end up quite pleased with the results. 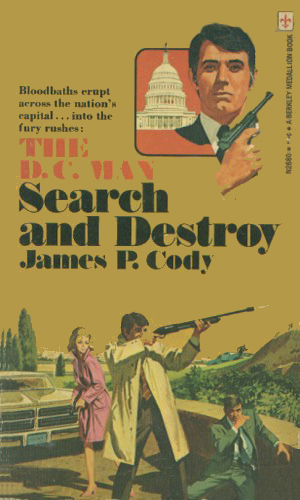 I wish Mr. Cody had continued the series as they were very enjoyable reading as a quick snack.